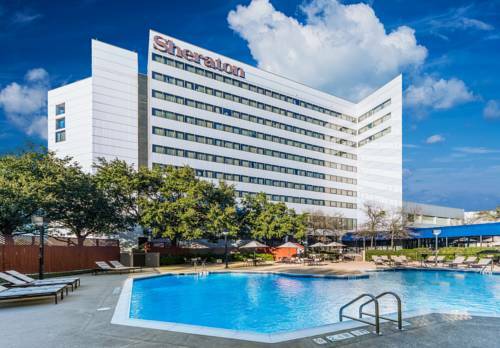 We look forward to welcoming you to the Sheraton North Houston at George Bush Intercontinental, which is conveniently located less than three miles from the airport (IAH). Our 24-hour, complimentary airport shuttle is always ready to pick up leisure and business travelers as well as convention attendees. When you have time for a break, enjoy championship golf on challenging nearby courses, including Tour 18.Our 419 attractive guest rooms are complete with wireless High Speed Internet Access and the irresistible Sheraton Signature Sleep Experience. Two private concierge floors with added amenities are also available.Computer workstations in the lobby and High Speed Internet Access throughout the hotel make it easy to stay productive while traveling. Work up a sweat at the 24-hour Sheraton Fitness by the outdoor pool. At the end of the day, sip on your favorite beverage or grab a comforting snack in Drifters Lounge, or savor a tempting classic American-inspired selection at Drifters Bistro.We also offer over 30,000 square feet of flexible meeting space with up to 24 breakout rooms, to accommodate anything from weddings to award banquets to corporate business meetings. Our Grand Ballroom features 14-foot ceilings and can be divided into five separate salons.Great service and amenities make the Sheraton North Houston at George Bush Intercontinental an ideal choice. The Sheraton North Houston at George Bush Intercontinental is centrally located to various companies in the airport/Greenspoint area, including AtoFina, US Filter, Chevron, Eagle Global Logistics, Daimler Chrysler, Halliburton, ALPA, Baker/Intec, Continental Airlines, Exxon Mobil, Anadarko, and Kerr McGee. With easy access to both Interstate 45 and Highway 59, the hotel is within a half-hour of downtown. Enjoy championship golf on six challenging nearby courses, including Tour 18 Houston; Cypresswood Golf Clubs 36 holes, including the Tradition Course; and the Tournament Players Course. Watch the horses run at Sam Houston Race Park, entertain the kids at SplashTown Water Park, or shop till you drop at Deerbrook Mall, all only minutes away. Stop by our convenient lobby coffee shop for Starbucks coffee, cappuccinos, lattes, espressos, Tazo teas and a variety of quick breakfast and lunch options. Your favorite drinks, appetizers, and meals await you in Drifters Lounge. Its casual atmosphere features several 37-inch flat screen TVs, as well as a few lounge seating areas with 52-inch flat screen TVs. Enjoy a casual but yet sophisticated dining experience with a Classic American menu in our Drifters Bistro.